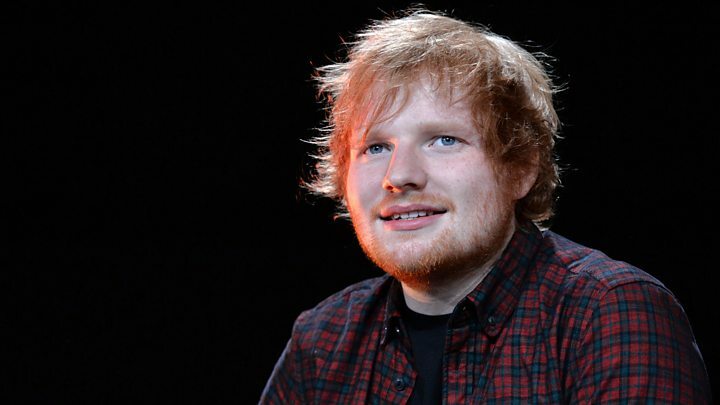 Ed Sheeran says he has a "trick up his sleeve" to boost his chances of getting the UK Christmas number one single. 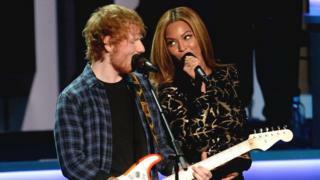 The star has put out a new version of his ballad Perfect, with vocals from Beyonce, sending it straight to the top of the charts on Friday. Asked if he wanted to stay there for Christmas, the 26-year-old replied: "I'd be lying if I said no. "I do have one more trick up my sleeve. It's not like a Beyonce trick, but it's quite a cool trick." Without giving too many details away, the singer hinted he'd made a third version of the song, with a different duet partner. Media captionEd talks to MistaJam about being at the top of the chart. Again. "This next one, no-one's expecting," he told BBC Radio 1's Chart Show. "It's more for my dad's generation. It'll be out in a week. You'll see then." With streaming numbers in his favour, Sheeran is practically locked in for the coveted Christmas number one slot. Bookmakers Ladbrokes have him as the 8/11 favourite, far ahead of the other contenders. "At this moment we can't really see anyone knocking Ed off the Christmas top spot," Ladbrokes spokesperson Alix Apati said. "Anyone else would have to do something pretty special between now and Christmas to stand a chance of getting that festive top spot." The closest competition is expected to come from Wham! 's Last Christmas, which fans are hoping to send to number one in tribute to George Michael, who died on Christmas Day last year. A regular feature on Christmas playlists, the song has never been Christmas number one. It was kept off the top spot by Band Aid's Do They Know It's Christmas? when it was first released in 1984. Other contenders for this year's festive chart include X Factor winners Rak-Su, whose debut single Dimelo entered the top 40 at number two in this week's countdown. And Mariah Carey's festive classic All I Want For Christmas Is You jumped from 22 to number five in the new chart, but it seems unlikely to reach the summit. Meanwhile, in the album charts, Sam Smith returned to the number one slot this week, closely followed by Sheeran's ÷ and Together Again from tenors Michael Ball and Alfie Boe. U2 only just squeaked into the top five with their latest album, Songs Of Experience, while there were new entries lower down the chart for Pete Tong's Ibiza Classics, which features orchestral versions of vintage dance hits, and the Rolling Stones' compilation of early BBC sessions, titled On Air.